Teaching your parrot to talk, or, more accurately, to repeat words and phrases, can help you bond with the pet and develop into a fun interaction you both enjoy. Keep your parrot in a common area of your home and talk to him throughout the day, letting him be part of the hustle and bustle of family life. Parrots are naturally vocal creatures, though you may have better luck getting males to talk than females. 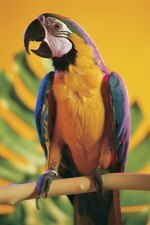 Regular interaction with your parrot will encourage talking and other forms of vocalization. Parrots actually mimic words, phrases and even ambient sounds they regularly hear. Young birds tend to be better students than older ones, so the younger you start training your bird, the better your odds for success. If you have multiple parrots, and one learns to talk, the others may learn from him and start repeating the words he says. Hold you bird in front of you when you're working with him, or put him on a stand in front of you. This approach helps hold your bird's attention. Pick small, simple words, such as "hello," "goodbye" or the bird's name. Repeat the phrase not just when you're in a teaching session but throughout the course of a normal day. An enthusiastic or unusual voice is more interesting to a parrot, so take it up and octave to grab and keep his interest. Giving a small treat for any type of initial vocalization, even a whistle, will encourage more sounds that may eventually lead to words. Use positive reinforcement in your training by giving your parrot a snack he enjoys and naming the snack as you do. For example, with a small bowl of apple chunks in front of you, say "apple" each time you give your bird one. He'll start to associate the words with various treats and may come to ask for what he wants by name. Create other similar routines, like saying "bedtime" when you cover his cage in the evening or "lunchtime" when you feed him. While cursing parrots are funny in the movies, you might not enjoy a foul-beaked bird in your home. If your bird starts saying a word or phrase you don't like or that you find annoying, ignore the behavior -- don't react in any way. Don't repeat the word, and don't allow anyone else to, either. Your bird will likely lose interest and drop the word from his vocabulary. Parrots learn by repetition, so make a recording of yourself repeating words, and leave it for your bird to listen to when you're not around. You can play music for your bird, which might encourage vocalization in general. Keep in mind that parrots enjoy social interaction, so working with your bird in person will typically yield the best results. Some birds are more talkative than others, and some never learn to talk at all. Most get better as they go along. You can help develop your parrot's language skills by picking up on what you think the bird is trying to say and repeating it correctly. For example, if your bird says what sounds like "gerble" when you leave a room, correct him with "goodbye" and wait for him to repeat the correct version back to you.